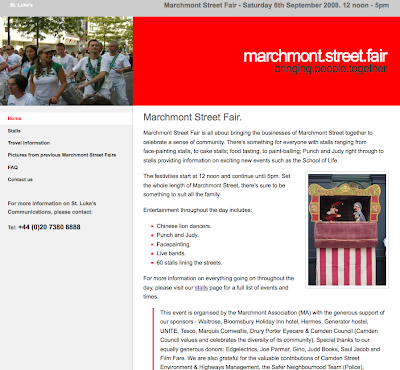 Marchmont Street Association sadly don't have the capacity to use this at the moment but this is a quick website I knocked up to advertise the Fair on Saturday. I've just spoken to Milena from the Association about the possibility of working with them in the future. They're obviously a very small association so hardly big business but I think keeping involved in the community is very important, and being involved in a charitable organisation looks great on the St. Luke's profile! Milena didn't even know St. Luke's was here, never mind that we'd been here for about 15 years - of course that'll all change once they taste our amazing cakes! I've had to host the site on a website I made at Uni just so that people could see it but it's got details of the entertainment going on at the Fair (including Chinese Dragon Dancers and live bands) so if anyone happens to be in the area, do stop by! I think this is brilliant. show's real community spirit and is very good for the company.